Dc Power Cord by Digi at Pacs BG. MPN: 76000854. Hurry! Limited time offer. Offer valid only while supplies last. 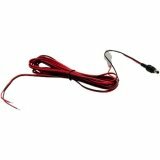 DC Power Cord - 2.1mm locking barrel plug to bare wire, 4m. View More In Computer Headsets - Page 2. DC Power Cord - 2.1mm locking barrel plug to bare wire, 4m. Compatibility-WR44(v2).